Remote control helictopers, aeroplanes and cars move over and make way for the The Parrot AR.Drone 2. Easily controlled by Wi-Fi using a smartphone or tablet, the Parrot features a high definition camera with a video recording facility, plus flight data sharing, a patented piloting mode, and an innovative pressure sensor for increased stability at any altitude. For gaming purposes, this camera can also recognise specific shapes and colours to show augmented reality elements on the screen. Now you can record and share your flying experiences with others, thanks to the new AR.FreeFlight 2.0 piloting application. Additionally with the Travelling Feature, the pilot can film HD video sequences like a professional. Simply select the direction of travel, plus the duration, and the AR.Drone 2.0 does the rest automatically. Flying is very simple, with your thumbs placed on either side of the screen, a control button automatically appears beneath. 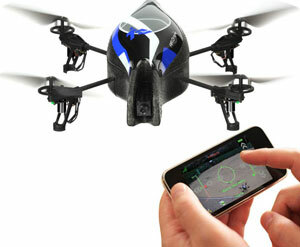 Press and hold the left button and the AR.Drone 2.0 follows the movement of the pilot's device. It moves forward, backwards or sideways when you tilt the tablet in the appropriate direction. Slide your finger vertically or horizontally over the right button, and the quadricopter rises, descends or slowly rotates left or right. Thanks to Parrot's patented new Absolute Control mode, the player accesses an even more intuitive piloting system. With a 3D magnetometer, the AR.Drone 2.0 knows its precise position with respect to the smartphone, which becomes the reference point. The pilot no longer needs to worry about the orientation of the AR.Drone 2.0. Experienced players may still select Relative Flight Mode, to switch back to conventional control. This disables the magnetometer, and the pilot can manage the quadricopter's orientation without assistance. 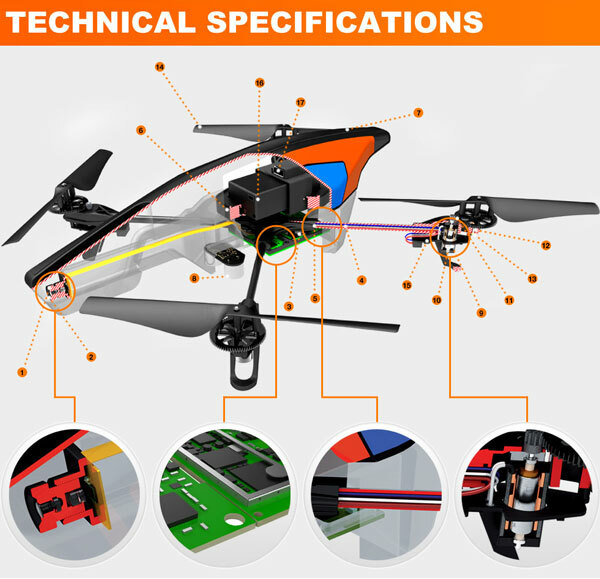 Surprisingly stable at any altitude, the AR.Drone 2.0 contains several micro electromechanical systems, a 3-axis accelerometer, a 3-axis gyroscope, a 3-axis magnetometer and a pressure sensor to correct the alignment automatically. The quadricopter generates its own Wi-Fi connection, with a range of up to fifty metres. It will fly continuously for twelve minutes with the 1,000 mAh rechargeable lithium polymer battery provided, whilst recharging from the mains in an hour and a half. Four high performance propellers, specially designed for the AR.Drone 2.0, make exceptionally smooth flights possible. A second vertical camera placed beneath the quadricopter, can be selected to show live video on screen, and additionally measures the craft's speed using an image comparison system. Suitable for beginners and experts, the AR.Drone 2.0 features a tough carbon fibre central cross. It is supplied with two distinctly different hulls, made of flexible expanded polypropylene foam. They are both highly resistant to impact, and protect the more delicate internal parts. For outdoor flight, the lightweight streamlined hull reduces wind resistance and preserves the quadricopter’s excellent handling and stability, even in a light breeze. When operating the AR.Drone 2.0 with the indoor hull, the four foam rings protect the blades, and your furniture from impact. As a safety feature, the rotors are designed to stop immediately upon contact. Two pairs of red and green lights are positioned on the landing gear to assist orientation. Download AR.FreeFlight 2.0, the free control application, from the App Store in iTunes and you're ready to fly. By tilting your device, you control the direction of your AR.Drone, and by releasing it, the AR.Drone is instantly stabilized. Thanks to the AR.Drone's autopilot feature, anyone can be an expert as the embedded sensors allow for easy take-off and landing. The new AR.Drone 2.0 also features the exclusive and patented Absolute Control piloting mode for beginners that can be adjusted with your growing expertise. With the new AR.Drone 2.0-generated WiFi N Connection, you can fly as far as 165 feet away. The AR.Drone 2.0 pressure sensors on-board provide unique stability that will automatically correct and maintain a still position in the air regardless of altitude and wind up to 15 mph. Keep track of your flight data, location, photos and videos and share them with a community of other pilots from all over the world thanks to the AR.Drone Academy. Check who is flying in your neighborhood or watch videos from pilots at the other end of the world. This flip move is exclusive to AR.Drone 2.0. Become a daring pilot and perform barrel rolls by simply hitting a button. The full hull shield protects the AR.Drone from impacts that occur during wild battles against enemies hidden in the rooms of the house. The streamlined colored hull is aerodynamic, allowing greater control outside. 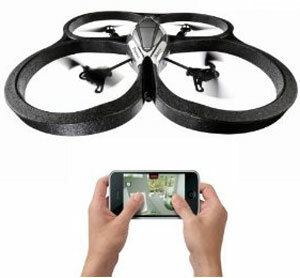 AR.Drone is made of carbon fiber and high-resistance PA66 plastic. You can replace all parts for easy repair. Not only can you see what the AR.Drone sees with the front-mounted camera, you can play a wide variety of games in augmented reality. AR.Games are available in the App Store in iTunes. Choose from a selection of single-player and multiplayer games, using the AR.Drone's camera and the augmented reality applications. Shoot enemies or other drones. Your flights are now even more detailed! The AR.Drone Academy automatically tracks your flight data such as altitude, speed or duration every time you take off. get more out of your flights thank's to these new statistics and see them either as graphics or as text while you watch your video playbacks. Look how high and fast you flew. View the word seen by the AR.Drone. All your fights are geolocated and placed on the AR.Drone Academy world map. 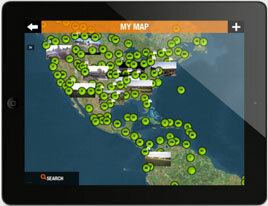 Browse all of your flight locations, watch the videos your recorded, and view your pictures and flight data. Looking for the perfect place to fly? Search for hotspots reported by other pilots on the AR.Drone Academy map and leave your own tips. Don't forget to also for tips on dangerous spots so you can stay away from trouble. Upload the videos and pictures you want to back-up and they ill remain accessible anytime, anywhen even after you deleted the video/picture from your device. You can now share your data directly on Facebook and/or twitter in addition to Youtube and Picasa. 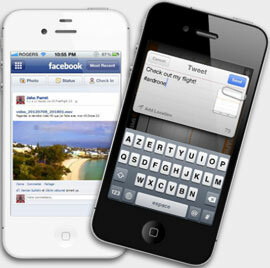 Each post can also be directly replicated on your wall or feed. Share your skills with your friends. Experience a world of unique flight! Through the AR.Drone Academy you can accedd shared content from pilots all over the world. Look out for videos shot at the other end of the world or find out who has been flying the highest. The AR.Drone Academy is THE place to be for all pilots.